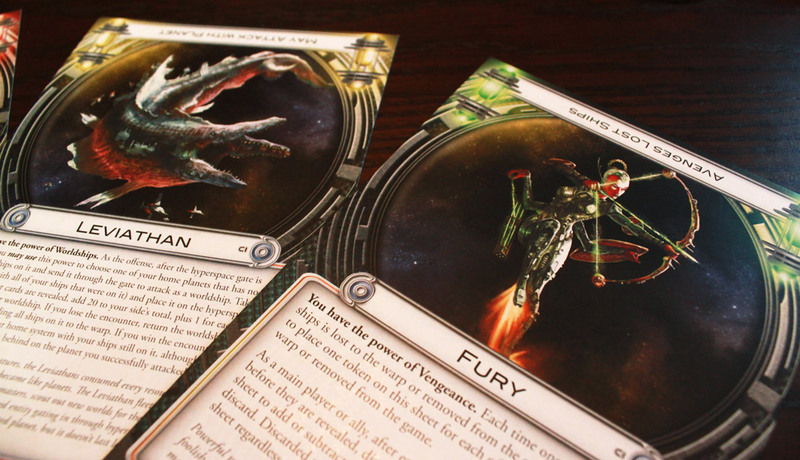 The original version of Cosmic Encounter was the first board game that had expansion packs, and with a subtitle like “A game of infinite possibilities,” it’s no surprise to see Fantasy Flight’s current edition of the game get some expansion love. Cosmic Incursion is the first expansion. Does it add more for fans of the original? Does it make the game appeal to those who didn’t like the original? Find out below! 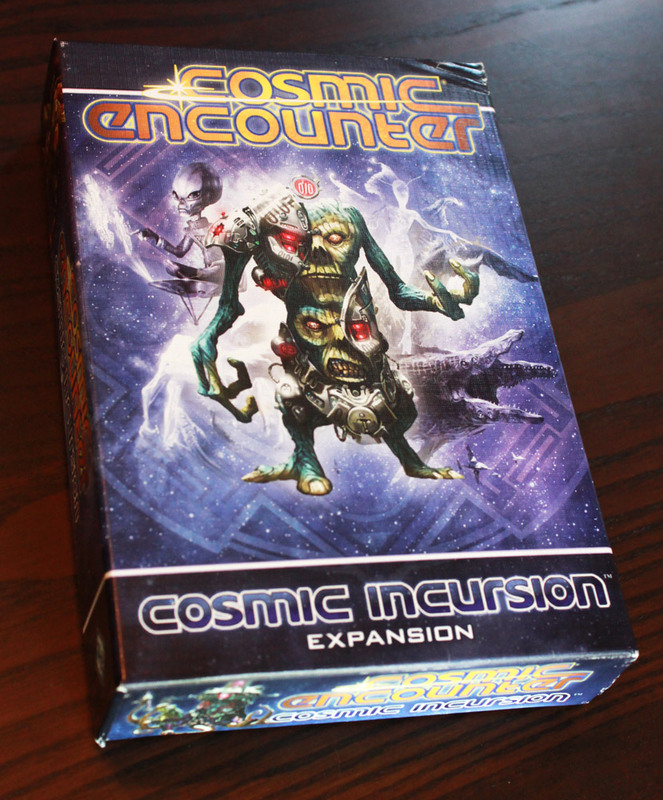 Note: Cosmic Incursion is an expansion for Cosmic Encounter. The original game is required to play. 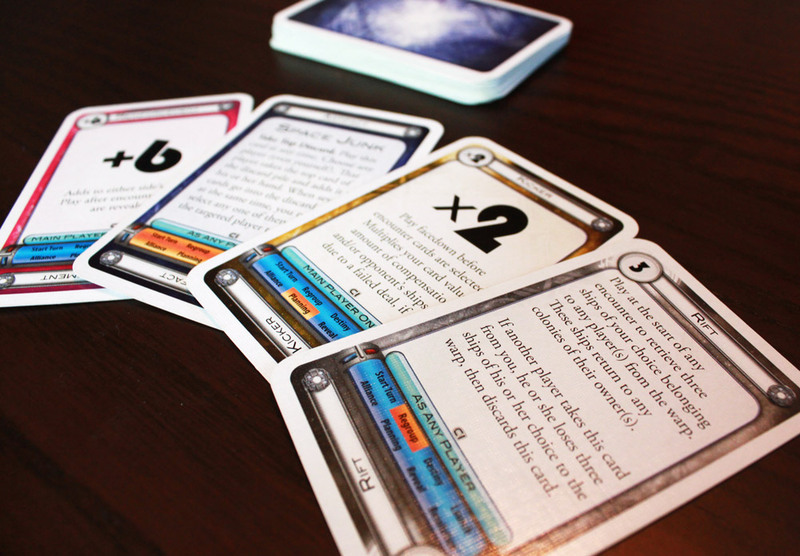 You’ll want to check out my original review to get a grasp on Cosmic Encounter as a whole, as Cosmic Incursion doesn’t drastically alter the gameplay (other than the normal game-bending alien power thing. You know… the whole point of the game), but it does add a bunch of good stuff. First of all, you get a new player color (orange) including all the planets and ships to go along with it, allowing for a sixth player (or more artistic freedom when choosing your favorite color with which to conquer the universe). In addition, you get twenty new wild and zany alien powers, from the ship-absorbing Fungus, to the questioning Seeker, to the time-traveling Chronos. Finally, you get a new deck of cards—the rewards deck—which is the only thing that really changes up the gameplay a little bit. The rewards deck is a uniquely backed deck that you can only draw from as a defender reward. It offers both very powerful and exceptionally poor cards, adding a risk/reward element to drawing from the deck. Since the backs are different from the normal deck, players can attempt to steal those cards for compensation (or whenever one gets to steal cards from another hand), but be warned: many rewards deck cards have a devastating effect on a player who steals them from another—again with the risk/reward thing. It’s no secret that I love Cosmic Encounter, and this expansion only serves to up the ante. The new player color as a nice edition—it always stinks to have to exclude a game from your game night just because you have one too many players, and while five is still the ideal number, the game continues to work with six (and makes alliances an even more key part of the game). It does get a little crazier, but if you’re a fan of Cosmic, that shouldn’t bother you too much. If anything, you get to see more ways that alien powers interact in wild and unexpected ways. The new powers are exciting, unique, and definitely a bunch of fun. One of my favorites, the Fungus, can cling to enemy ships after it defeats them, resulting in delightfully tall (and powerful) stacks of Fungus-ships. The Seeker can ask a yes or no question about the encounter card being played. The Sniveler can whine about their situation and force other players to either allow them a leg up or to take a small hit themselves. The Disease can spread to other planets, and Chronos can time-travel to redo an encounter. There are twenty new races in all, and this is just a sampling of some of the zany things you’ll see. The inclusion of the rewards deck is excellent. It adds a big risk/reward system (you could draw that second morph card, or the 23 attack, or the ever-so-useful crooked deal negotiate card, but on the other hand you could draw the -07, and no one wants that. Oh wait, the Loser and Anti-Matter do. What a crazy game!). Some of the cards even add some direct bluffing mechanics to your encounters—the “Kicker” cards can be played in addition to an encounter card, which add a multiplier to your score—a x3, a x2, or a x0, giving you a chance to get your opponent to waste his highest attack against something that’s actually pathetic, or turn a mediocre attack into a great one. The possibilities are endless. Or, should I say, infinite. The rewards deck also adds a few extra artifacts: another Cosmic Zap and Card Zap, as well as a few new ones that let you nab extra cards at the right moment or even zap any player’s hand (including your own) forcing them to redraw. Finally, Rift cards allow you to retrieve extra ships from the warp (of any players—a very useful tool to draw in allies), but if stolen or taken in any way, cause the thief to not only discard the Rift, but lose a few ships to the warp as well. There’s your risk right there. The rewards deck definitely makes the prospect of being a defensive ally a more tempting one, which can extend the game length a little but also balances it out more. 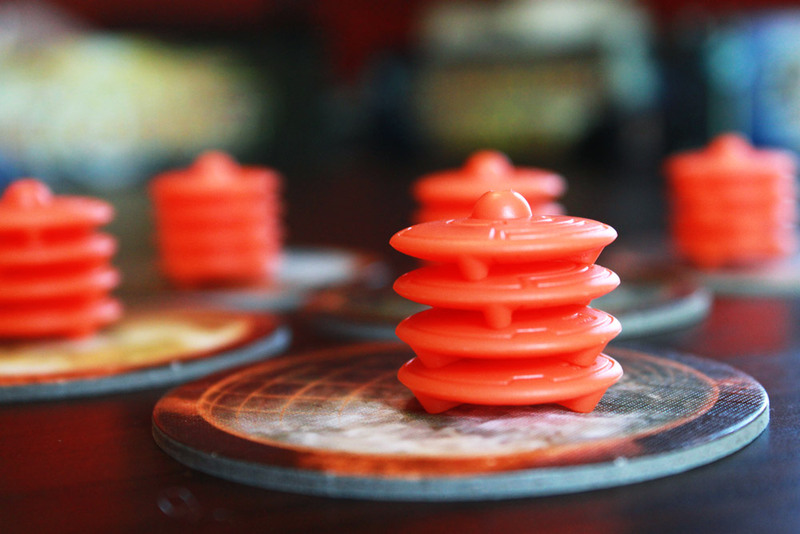 Players will have to work harder and use up their uber-powerful cards for the right moments, so strategy and alliances are needed in addition to a mighty power. The base game didn’t offer much visible incentive to ally with the defense until the offense was fighting for their final colony (side tangent: I think this is often why games of Cosmic Encounter seem to “flop”—players too eagerly invite allies or join up with the offense, pushing players up to the limit very quickly. When allies are more carefully invited and accepted, the game tends to even out a bit and float away from seeming randomness. Again, this works best with four or five players). Anyway, the rewards deck just makes defensive allying seem a lot more viable, which is a good teaching element for the game. In conclusion, Cosmic Incursion doesn’t reinvent the (already fairly spastic) wheel, but it does add a lot more to the package. Since the MSRP falls under $25, this is definitely a worthy addition to your Cosmic collection. The new aliens are fun, and the rewards deck encourages players to think through their alliances more carefully, which improves the game. Who knows? It may help players enjoy the game more. I’ve let it be known elsewhere that I don’t like Cosmic Encounter. I don’t like games that hinder players from the very beginning of the game by virtue of their power or card draws. And while I agree that good bluffing can make up for some of this, at the end of the day, if you’re stuck with a hand of negotiates, you’re stuck with a hand of negotiates. And being the low man on the totem pole doesn’t entice the other players to invite you into the spoils of alliances. All in all, Cosmic Encounter is just not my cup of tea. Left: normal deck. Right: Rewards deck! While I’m still not a fanboy like @Futurewolfie obviously is—for example, I can’t wax on all day about it—I think Cosmic Incursion makes the game much more fun. I don’t really care about the twenty new races (the game is about imbalance, which is already a losing proposition for me, so twenty new ways to imbalance it doesn’t fix this), or the sixth player color (the game runs optimally at four or five). What I think is a fantastic addition is the rewards deck. I won’t go into it too much except to say that @Futurewolfie is right in talking about this as a positive point. It gives a benefit to players choosing to ally against the offense. But more important, it makes a game that I would never choose to play much more tolerable when it sees its inevitable time in the rotation. 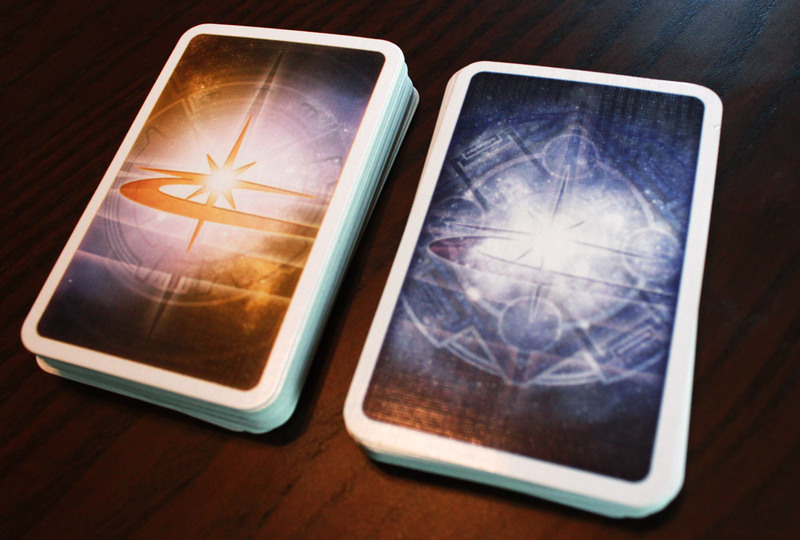 I wouldn’t recommend buying Cosmic Encounter, but if you do buy it, buy Cosmic Incursion too. Your Euro-loving friends will love you for it. 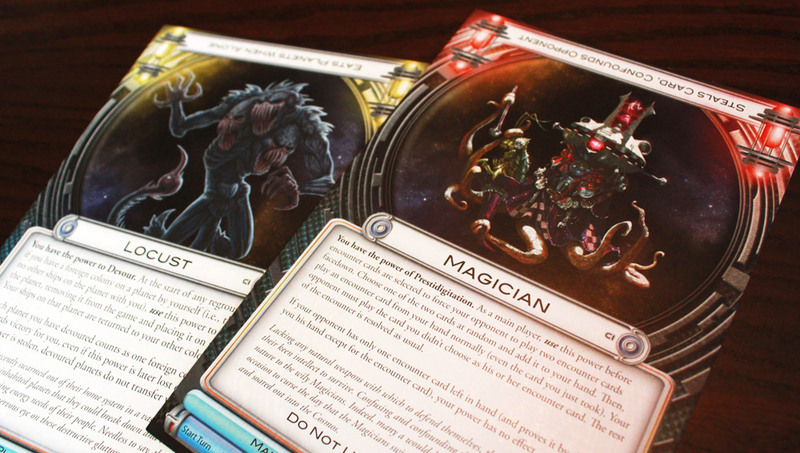 And they might even ask you to ally with their next game night…as long as Cosmic Incursion is in tow. Previous ArticleFDQ: What Game Gets a ’10’? Next Article FDQ: How Long Do Your Games Stay on the Shelf? My gaming group is usually pretty confused by Cosmic Encounter, mostly because of the lack of much direct (non-arbitrary-feeling) incentive to ally until someone is about to win. Since it sounds like the rewards deck helps to fix this, I might have to pick up this expansion. YES. That is one of the main things I don’t like about the game, so the rewards deck is a necessity for me, almost to the point where I won’t play the game without it. Okay, I’m not going to be a baby about it, but seriously: necessary. Apparently I need to write a Cosmic Encounter strategy guide next. “if you’re stuck with a hand of negotiates” you get to steal cards from your opponents each time you lose ships because of playing the negotiates, so it works out. I’m generally a purist game designer who prefers everything to be fair and carefully balanced (I made Linkage, if you’re curious about what my designs are like). But Cosmic is an exception; playing Cosmic is not about winning. It’s about having a load of fun messing with people. How can you be confused by the incentive to ally at all times? If you ally on the offense, you can get a colony if the main offensive player wins. If you ally on the defense, you can get new cards and/or ships for each ship you risk in the Encounter. This is one of the basic principles of the game.